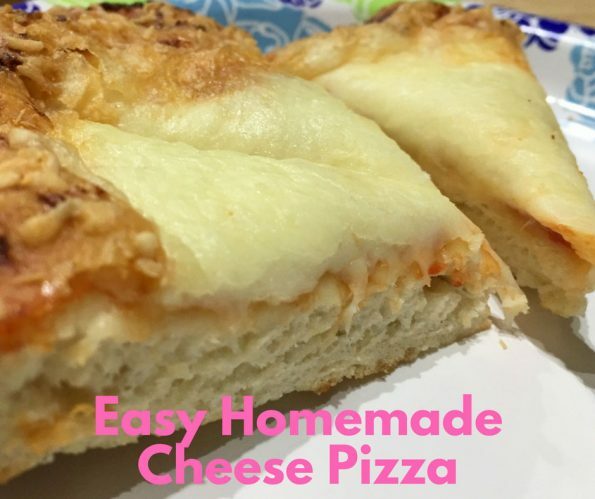 This easy cheese pizza recipe using homemade pizza dough and pizza crust is made completely from scratch and this is a recipe for homemade cheese pizza with homemade thick and chewy pizza crust. If you are looking for homemade thin pizza crust recipe, I am going to post the recipe for thin crust pizza soon. This pizza crust is like the traditional old fashioned thick and chewy pizza crust, which I like very much, although my family prefers thin crust pizza most of the times. 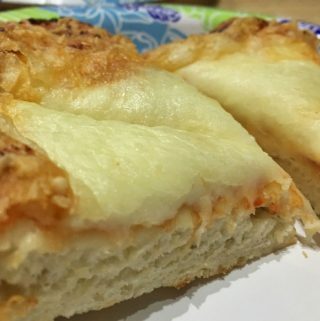 But if you like thick and chewy pizza crust just like me, do try this homemade easy cheese pizza recipe using homemade pizza dough and crust for making delicious cheese pizza with thick and chewy crust with a lot of flavor from the breaded crust. For thin crust pizza, it is best if you can make the crust by hand stretching method, but for thick crust I prefer making the crust using a rolling pin which will help you to easily make the thick crust over which you can add the sauce, seasoning and cheese (and vegetables if you like to try a veggie pizza). This thick crust chewy cheese pizza is kid friendly and the crust is soft and chewy with a lot of delicious flavor. If you like easy kid friendly recipes, try this easy fluffy pancake recipe here and carrot pancake recipe here. 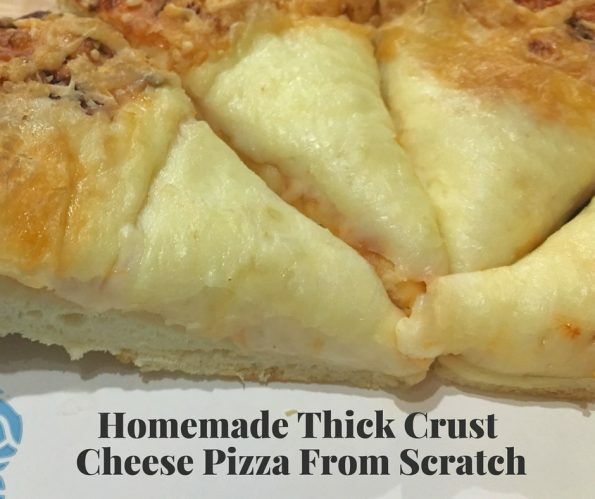 So here is how you can make this thick and chewy homemade cheese pizza following this easy cheese pizza recipe using homemade dough for pizza crust. This easy homemade cheese pizza recipe from scratch is great for those who love a thick and chewy pizza crust. Mix yeast in warm water with a spoon of sugar, keep it closed for about 8 to 10 minutes until yeast is dissolved and you get a foamy yeast mixture. In a large bowl, mix together the flour and salt evenly. Add the yeast mixture to the dry flour and mix well with hands. Add a spoon of olive oil to it and mix the contents well. Knead with your hands over a flat surface to make a round dough. Keep the dough inside the bowl and close it, let it rest and rise for about 1 hour time. After one hour of rising, open the bowl and gently press the dough with your hands. You can divide the dough to make two medium sized balls and keep the dough balls covered inside the bowl again for another one hour. After one more hour, you can open the bowl and the dough is ready to be used. You can gently knead the dough balls again using your hands. Now that the dough balls are ready, lets roll them dough balls to make the pizza crust. You can either make thin crust pizza crust or regular pizza crust based on how much thinly you roll it. As we discussed earlier, this dough is enough to make two medium sized pizzas. If you have enough space and two pizza stones you may bake the two pizzas together, or you can work on the second one after the first one is done and out of the oven. I had to bake the two pizzas one by one. So let's keep the one ball of dough untouched until we finish the second one. In a flat surface dusted with little flour, roll the fist dough ball to make the first pizza crust (you can keep the other dough ball closed until we are done with the first one). Preheat the oven to 450 degree Fahrenheit. Once the pizza crust is rolled, transfer the rolled pizza crust to a greased pizza stone (or even a greased or lined large baking sheet will work if you can fit the crust inside). If you can bake both the pizzas simultaneously, you may also do it that way. Spread about 3 tablespoons of pizza sauce ( I used regular tomato sauce) in the rolled crust (adjust the amount of sauce as you prefer) just leaving a little space from edges. Top with about 1 cup of shredded mozzarella cheese in the crust over the layer of sauce, adjust the amount as you need (you may add little more if you need it very cheesy). Bake for about 15 minutes or until the pizza crust is browned and the cheese is melted. Transfer the baked cheese pizza from the hot oven as soon as it is done to avoid over baking and you can start working on the second pizza. Just follow the same steps, gently knead the dough ball again with your hands, roll into the crust, add the toppings and bake the second one also as instructed in the above steps. Once the pizzas are somewhat cool (while still warm), slice and serve, enjoy for lunch or dinner! 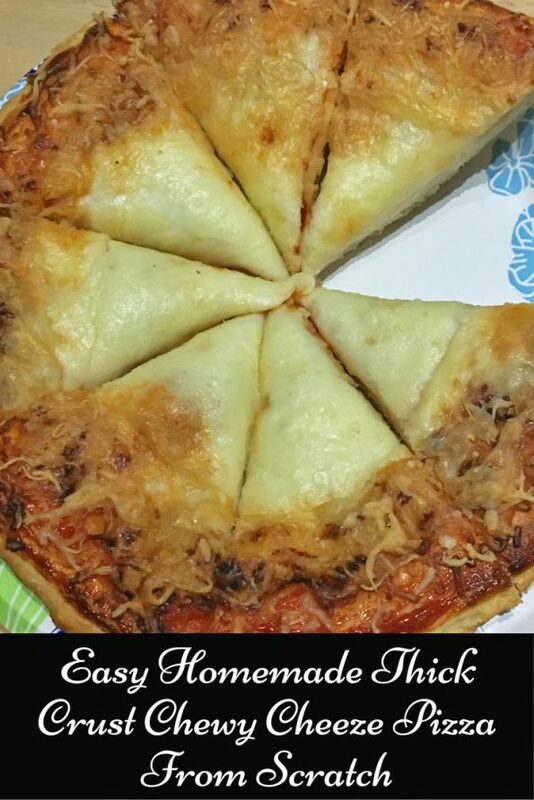 Hope you found this post on easy cheese pizza recipe from scratch helpful in making easy and yummy cheese pizza for lunch or dinner!